Even with my flexible laid back lifestyle I still get a thrill knowing that the alarm won’t be going off to get us out of bed. Those dulcet tones of Radio New Zealand bring forth the day with news in the world are something that are going to have to wait another week. Funny though when you don’t have to get up you wake up earlier and earlier. 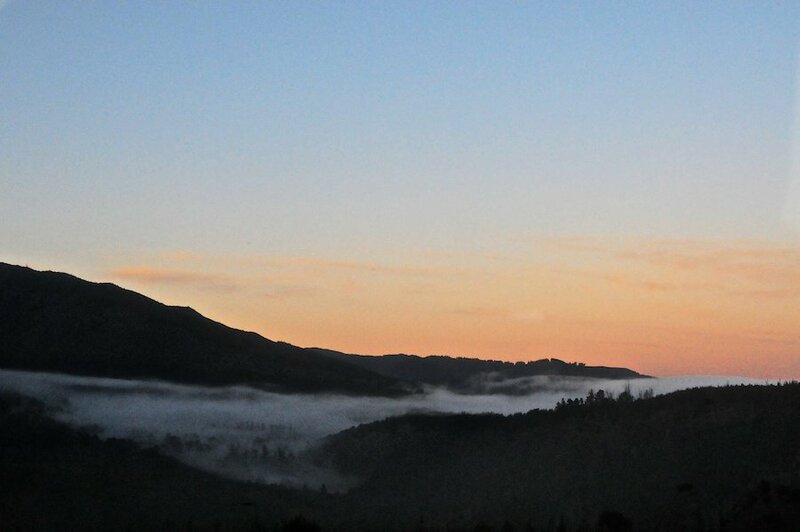 Seeing the mist in the valley and the morning glow behind the hills yesterday made up for not being able to sleep in like most normal people do when they are on holiday. I fear I am becoming my father’s daughter. Waking up earlier and earlier to the point that you go to sleep earlier and earlier losing at one end of the day to gain the other. Neither is that sociable but I take comfort that when you’re on holiday anything goes.